Irkutsk Oblast (Russian: Ирку́тская о́бласть eer-KOOTS-kah-yah OH-blahst') is a region in Eastern Siberia, which borders Krasnoyarsk (region) to the west, Evenkia to the northwest, Yakutia to the north, Zabaykalsky Krai to the northeast, Buryatia to the southeast, and Tuva to the southwest. 53.30277778108.004722222 Lake Baikal — located between Buryatia and Irkutsk Oblast, is the deepest and oldest lake in the world and also the planet's largest body of freshwater. 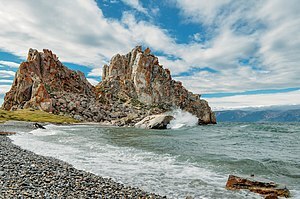 53.156666666667107.383611111113 Olkhon — the largest island in lake Baikal is a real jewel, and worthy of the effort it takes to reach it. Irkutsk Oblast, in particular the capital Irkutsk and the shores of Lake Baikal, is likely Siberia's top travel destination. Russian is understood and spoken by all; some members of ethnic minorities (especially the Buryat) are bilingual and speak their native languages with one another. Irkutsk Airport (IKT IATA) is one of Russia's most important and receives international flights from Mongolia, China, South Korea, Thailand, and Uzbekistan. Domestic flights are available from most major Russian airports, including: Saint Petersburg, Moscow, Khabarovsk, Yekaterinburg, Vladivostok, and many others. Despite the importance of Irkutsk Airport, most travellers still arrive via the Trans-Siberian Railway, which stops at (from west to east): Taishet (junction with the Baikal-Amur Mainline), Nizhneudinsk, Usolye-Sibirskoe, Angarsk, Irkutsk, among other less frequented settlements. Baikal Highway crosses the region from west to east. A bus from Ulan-Ude connects Irkutsk with Buryatia. Bratsk and Ust-Orda are accessible via the Baikal-Amur Mainline from the Trans-Siberian Railway junction at Taishet. The Baikal Highway (Байкальский тракт), a route from Irkutsk to Listvyanka village usually taken by marshrutka. One-hour trip starts from Irkutsk reservoir and is 68km long. The road is in some distance from the Reservoir that can be seen by rare glimpses as the road goes up and down along the hills covered with pines, birches and bush. The Circum-Baikal Railway (Кругобайкальская железная дорога), a memorial railway in Pribaikalsy National Park. It was a part of Trans-Siberian Railway in active exploitation till 1950s. When the main bypass was constructed the Railway lost its importance and is used now for tourist and emergency purposes. A few carriages depart from Slyudyanka, the southernmost station and 4h 40min later arrive in Baikal station, which is also a port up north. Enjoy panoramic views full of beautiful nature as the train moves along the shoreline. There are four stops and 38 tunnels during the trip. Retro trains (№988/987 Байкальский круиз) shuttle on special dates. Rafting on Irkut river. Whitewater grade is 1-3 in some places of 150 km river. Michel Strogoff by Jules Verne. Local vodka produced by OAO "Kedr": «Baik», «Слава», «Байкальская», «Звезда Байкала». While being in woods, beware of snakes that are commonly warming in the sun on the stones. There is not many of them but some may be vipers. The other problem of this (and other regions of the North Hemisphere) is ticks. Their bites may be infectious. Usually vaccinations are taken beforehand. Irkutsk Airport is a useful hub to jump off to different parts of the country. For closer destinations, most will travel by the Trans-Siberian Railway, which leads to Kansk and further Krasnoyarsk in the west and to Ulan Ude in the east. The Baikal-Amur Mainline, which runs on a parallel track to north of the Trans-Siberian, begins at Taishet in western Irkutsk Oblast and on to Severobaikalsk. This region travel guide to Irkutsk Oblast is an outline and may need more content. It has a template, but there is not enough information present. If there are Cities and Other destinations listed, they may not all be at usable status or there may not be a valid regional structure and a "Get in" section describing all of the typical ways to get here. Please plunge forward and help it grow! This travel guide page was last edited at 04:43, on 10 March 2019 by Wikivoyage user Traveler100. Based on work by Wikivoyage users Traveler100bot, Kiaora, Zcarstvnz, AndreeBot, Jon deluxe, Wrh2Bot, Matroc and Texugo, Wikivoyage anonymous user 93.94.178.22 and others.